George Thomas Pritchard (or Prichard) was born in St Thomas’s parish, Oxford in 1896, the son of Joseph Thomas Pritchard (born in Watlington in 1838 and baptised there as “Joseph Pritchet” on 28 October) and his second wife Emily Jane Williams (known as Jane, born in Summertown in 1859). Sarah Pritchard (born in 1869/70, with place of birth variously given as Worcester and Pershore, Wiltshire; probably the child of that name reg. in the Dudley district in the second quarter of 1869). Rosina Emily Pritchard, known as Rosa (born in Oxford in 1872 and privately baptised by St Aldate's Church on 18 February). Joseph and Julia Pritchard evidently began their married life in Headington Quarry in the 1860s, but by the time of the 1871 census they were living at Severn Street, Worcester with their daughters Lizzie Florence (4) and Sarah (2). Their third daughter Rosina or Rosa was born in Oxford in 1872. George's father and his first wife appear to have separated, possibly before Rosa's birth. Certainly by 1875 Julia and their three daughters were all receiving indoor poor relief, and the two elder ones, Lizzie and Sarah, were later sent away to Cowley School. By 1881 George's father Joseph Pritchard, who was still working as a cordwainer, was living at Market End, Bicester with his daughters Lizzie (14) and Rosina (8), while his other daughter Sarah (13) was living nearby with her grandparents, Joseph Pritchard senior (72) who was also still working as a cordwainer, and his wife Ann (77). Meanwhile George's mother Julia (43) was back with her widowed mother Elizabeth Cleaver at 116 Walton Street and working as a laundress: she was described as married, but had reverted to her maiden name of Cleaver. The laundry was a big one: Mrs Cleaver had four laundress servants living at the house, as well as her two laundress daughters. By the time of the 1891 census Joseph and Julia Pritchard (the latter now described as a “lunatic”) were back together again in Oxford and were living at 104 Magdalen Road with their three daughters: Elizabeth (22) and Rosa (18) were working as domestic servants, while Sarah (21) was a self-employed pedlar or hawker (and confusingly described as married, even though her surname is given as Pritchard). Boarding with them was Emily Jane Williams (29), known as Jane, an unmarried laundress born in Summertown: she was to become Joseph’s wife (and George’s mother). Joseph Pritchard married Jane Williams in the Headington registration district in the last quarter of 1894: this was less than two months after Julia’s death, but the haste is explained by the fact that they already had one child and their second was on the way. Joseph took on Jane Williams’s two older children, namely Thirza Williams (born in Oxford in 1886/7) and Sydney Williams (born in Oxford in 1888/9). Lydia Jane Pritchard (born in Oxford on 20 September 1903 and baptised at St Thomas’s Church on 16 December). At the start of their marriage Joseph and his second wife Jane lived at 10 Catherine Street in east Oxford, and George himself was born there in 1896. Joseph was still listed as a boot maker at 10 Catherine Street in Kelly’s Directory for 1899. At the time of the 1901 census George (5) was living at 36 Essex Street, again in East Oxford, with his father Joseph (56), his mother Jane (41), his sisters Annie (8) and Lydia (1), and his two step-siblings. They also had a married couple lodging with them in this small house, where Joseph found room to work at home on his own account as a bootmaker. By the time of Lydia's birth in 1903 the family had moved to St Thomas’s parish in Oxford, and in 1903 their address there was given as 7 Wareham Yard, and in 1907 as Bookbinders Yard. At the time of the 1911 census George (15) was a news boy, living at 7 Hollybush Row with his father Joseph (66) and his mother Jane (52) and his sisters Annie (17), who was a factory hand, Rhoda (11), and Lydia (7). George’s father Joseph completed the census form himself and claimed to have been married to Jane for 18 years, perhaps to make Annie (who now had the surname Pritchard and was described as Joseph’s daughter rather than his stepdaughter) appear legitimate. The Thirza Pritchard (23) who was in the Cowley Road Workhouse in 1911 is likely to be the former Thirza Williams, George's stepsister. By 1912 George's father Joseph Pritchard, described as a shoemaker of 7 Wareham Yard in St Thomas's parish, was receiving outdoor poor relief from the Oxford Board of Guardians. By 1915 he was in Headington Workhouse in Headington Quarry parish, and he died there at the age of about 77, and was buried in Holy Trinity churchyard on 15 November 1915. 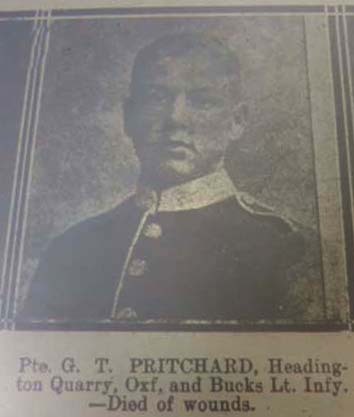 In the First World War, George Thomas Pritchard served as a Private in the ill-fated 2nd Battalion (“F” Company) of the Oxfordshire & Buckinghamshire Light Infantry (Service No. 9832). He died of wounds at the Somme in France at the age of 20 on 27 July 1916. George Thomas Pritchard is remembered on the stone plaque in the porch of Holy Trinity Church in Headington Quarry and the war memorial in St Thomas's Church, Oxford. His only connection with Quarry parish appears to be the fact that his father died in the workhouse there the previous year. The CWGC give the next-of-kin address as Church Street (St Andrew's Road), Old Headington because in 1917 his mother went to live there (probably with her seventeen-year-old married daughter, see below). Mrs Jane Pritchard moved to Old Headington after the death of her husband and son, and George’s war record states that she was living at 35 St Andrew’s Road after the end of the First World War (this may be an error for No. 33, the home of her daughter Mrs Rhoda Stockford, below, from 1917). George’s mother died at the age of 67 in the London Road Hospital (the former Headington Workhouse) and was buried in Headington Cemetery on 22 December 1931. Rhoda Pritchard (born 1899/1900) married William Stockford in the Headington registration district in the third quarter of 1917 when she was seventeen. He was then serving as a soldier, and for a while after the war was a munitions worker. He then returned to agricultural labour, and until 1925 the couple lived at 33 St Andrew’s Road. By 1927 they had moved to Wick Farm, where William was the cowman. They had five children baptised at St Andrew’s Church: William George Stockford (born 5 November 1917, bapt. 6 January 1918); Cecilia Florence Stockford (born 23 January 1920, bapt. 7 March 1920); Barbara Eileen Stockford (born 28 February 1925, bapt. 5 April 1925); Vera Constance Stockford (born 18 November 1927, bapt. 5 February 1928); and Raymond Stockford (born 3 July 1929, bapt. 4 August 1929). George’s sister Mrs Rhoda Stockford died in the Oxford registration district in 1991. Lydia Jane Pritchard (born 1903) married Frank Stockford in the Headington registration district in the second quarter of 1925, and their son Gordon Dennis Stockford was born at 15 Old High Street on 22 January 1926 and baptised at St Andrew’s Church on 7 March 1926. Frank Stockford died in the Oxford registration district in 1951, and George’s sister Mrs Lydia Jane Stockford married her second husband, James Dare, in the Oxford district in the fourth quarter of 1953.